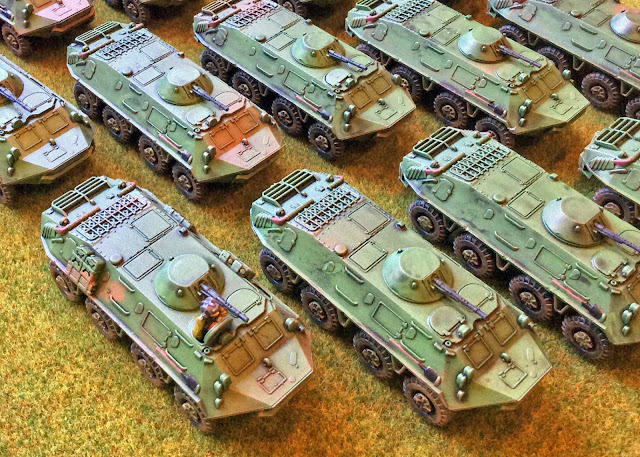 My quest to make a JNA (Yugoslavian) force for Team Yankee (using the rules for the East Germans) is getting closer as I complete the T-55s and BTR-60s. I need to add tank commanders to a few command models and the armor component will be complete. 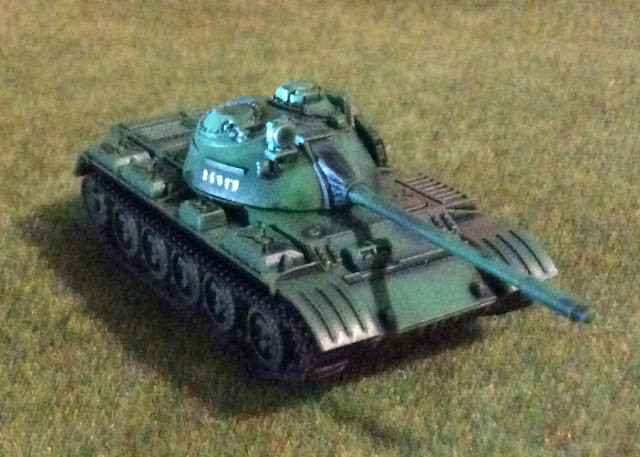 The T-55 tanks are from Plastic Soldier Company and the BTR-60 transports are from Battlefront Miniatures. I primed them with Goblin Green from Army Painter, but primed the wheel black before gluing them on. The tracks for the T-55s were first primed with the green, then hit on the top and bottom with black primer. I hit each model with Army Painter Dark Tone that greatly muted the bright green. I painted on the details before lightly drybrushing on dust and dirt using a light brown color. 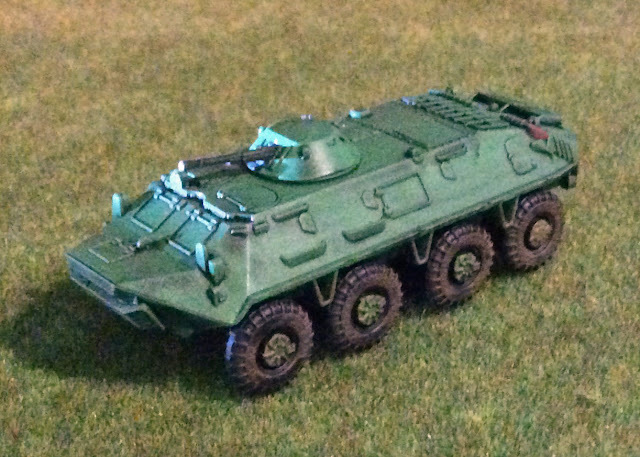 When complete, the force will include 31 T-55s and 15 BTR-60s, and I plan on adding a number of infantry units to the force as well. Looks fanatic man! I've slowly working on a similar tho I didn't think to use TY german rules, that's pretty cool. If you haven't already, QRF got few unique units such as their modified homegrown t-72 and some homegrown apc's. Thanks! I'll check QRF out too. The East German rules seemed like the best fit. For the infantry I figured the Zastava M70 is pretty close to the MPi KM assault rifle. I tried to get close to the standard "SMB – sivo maslinasta boja", what I believe means "grey-olive color" or "olive grey-green color". There is a slight issue. 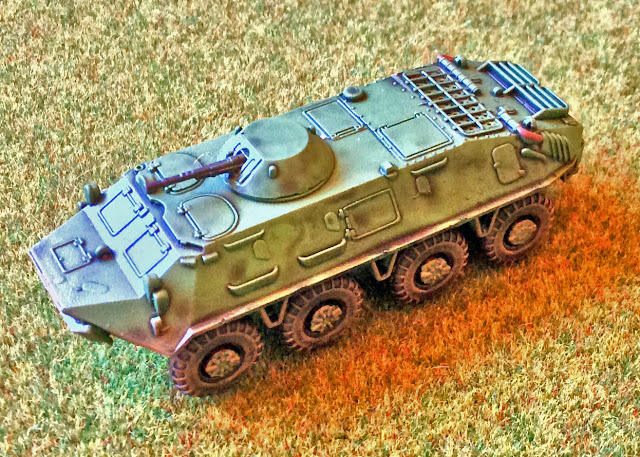 Only two BTR-60PB were acquired for trial purposes in 1967, and it was never adopted. 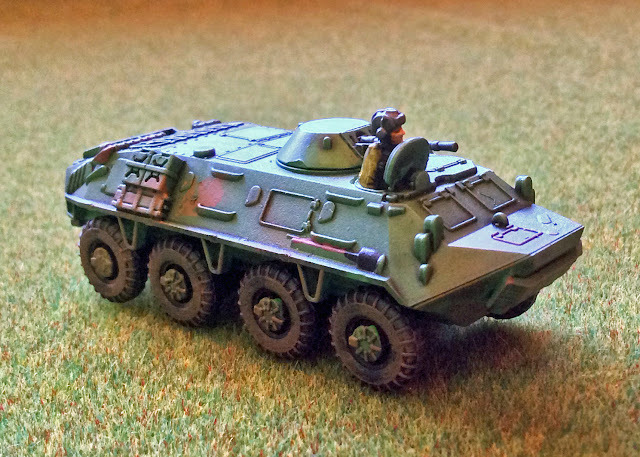 A certain number of BTR-60PU was acquired with SA-9 Gaskin system as battery command vehicle. Another vehicle, TAB-71 (a Romanian-made variant of BTR-60 with the petrol engine) was accepted for service in 1976, but exclusively for military and civil police forces. They were known as very unreliable vehicles for a myriad of reasons (including apparently low mileage per year and lack of purposely trained drivers) and MP vehicles were gradually cascaded down to federal and later republic police forces. While a total of 119 TAB-71 were brought, an operative number (including Soviet-made BTR-60PU) in the late 1980s was only around 60 vehicles. Haha- well, I guess my Team Yankee games will be a little more alternative history than I thought…. I thought the JNA had a small number (40 or so) of new Romanian TAB-72s in the early 1980s, but maybe that was just for police use? First JNA unit to receive them was the 282nd Military Police Battalion of Federal Secretariat for National Defense, which was also characteristic for having 20 vehicles in total, in the first and second company. Other seven MP battalions (in Belgrade, Nish, Skoplje, Zagreb, Ljubljana, Split and Sarajevo) included one TAB-71 company, each with 10 vehicles. There was also 99th Military Company, subordinated to Air Force and Air Defence HQ, with 3 vehicles in a single platoon. The rest went to police and Ministry of Interior forces. Army vehicles were gradually cascaded, and their role was taken by BOV M-86 armoured vehicle from 1986-1987. They were intended for mostly for internal and police tasks, like security, riot control etc. Thanks for the information. Any suggestions on infantry uniform type for Croatian / etc. home defense force? I've found images online for Croatian Army M65 Combat Jacket from Croatian War of Independence, but was wondering if the same type would be used in the mid-1980s for JNA forces (of Croatia). Croats mostly used US M81 Woodland and derived camouflage, while ex-DDR strichtarn "rain" pattern camouflage winter uniforms were also common in the very early period of the war. The M89 oak leaf pattern entered into usage with the JNA in 1990, but it was fairly rare and issued mostly to Serbian units once the war started. There was the M68 MOL (Maskirno Odelo Letnje) summer winter camouflage pattern worn as oversuit, first issued in 1968. It was quite different from woodland, so no commonality there. I suggest going by plain universal SMB (sivo maslinasta boja) uniforms for JNA troops. There were no national JNA forces (it was federal Army after all) and uniforms were standard even among Territorial Defence forces (although they usually wore older models). Thank you sir – you are a wealth of knowledge. Did you serve in the JNA or just a connoisseur of knowledge about that time / area? What do you think of the chance that BF will release official list(s) for JNA forces in Team Yankee? If the game lasts long enough, then I'm sure we'll see JNA. But it'll likely be a while yet. My father served as a not-commisioned officer first in YPA and latter in Yugoslav (Serbian) Army.